Read the transcript starting Mon. 12/17/18 on the Heinz Marketing Blog. 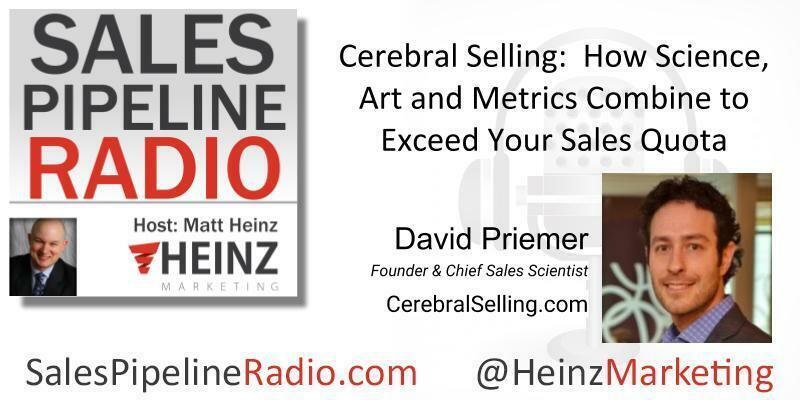 We were thrilled this last time to talk to David Priemer (a repeat guest) in an episode called, "Cerebral Selling: How Science, Art and Metrics Combine to Exceed Your Sales Quota". Matt: if you think about it like science, there're scientific systems. Whether it's, you know, the water table, or the meteorological systems, they're all based on certain amounts of rules, but those systems do tend to change over time. David: If you're kind of an astute observer, you can see when those systems change. Certainly, over the course of the last 20 years, the world of sales has changed quite a lot. I just love applying kind of the lens of the curiosity, the why, to the world of sales. I just love seeing it evolve. That's kind of how I harmonize these two worlds. Matt: I love that. You know, this is changing, of course, but there traditionally have not been a lot of educational paths in sales. We're starting to see some sales certificate programs and some sales management and sales mastery programs in higher education, but I think when you think about the people that tend to get into sales, it's a different brain set. Right? I mean, it's the left brain versus right brain. That scientific approach to selling, I would argue, is in the minority. I would say, in the follow-up question I was going to ask you before, is around just the connotation of science in selling. I think you've got a lot of folks that believe, that are in sales, that sales is an art, that if you put science behind it, then you lose what works on the periphery to build relationships and rapport, and you lose the uniqueness that each individual selling opportunity requires. But knowing your work, and seeing the work that you write, I know it's really, it's not one or the other, it's a combination of both. Talk a little bit from the science side how that really does help sellers. Then, marketers listening, as well, differentiate their work and impact. A big shout out to our sponsor, MailTag.io.